This post assumes that you’re a designer, or at least somewhat gifted in this regard, I’ll take you through the steps that I use in logo development. Logo design is one of the most important aspects of your brand development and should not be taken lightly as it is often the first impression someone will have of your company, and bad first impressions are hard to overcome. However, as you will see in the process unfolding below, your corporate identity is a result of the inter-dependence of your logo, slogan, mission/vision statements and even your inbound marketing strategy. All play an important role in determining your brand. As such, determining what you want your brand to exude is the first necessary step in creating a good logo. To clarify, I put logos into three categories: commercial, corporate and professional services (legal, accounting, medical…). By commercial I mean events, food products and such that can be done more quickly, even whimsically. I’m not speaking to these in this article. Nor am I speaking to professional services which, generally speaking, are best approached with typography as the focal point and are very conservative. I’m addressing corporate logos. And I usually include an icon with these that can symbolize the company’s uniqueness. It can also be used above the typography to create a more square-ish composition, or to the side of the type for a horizontal format. I find these to be the hardest design that I do and therefore the most personally rewarding. I take a lot of pride in my corporate logos and I’ve refined my process over the years. Welcome to my Barry EZ 6 Step Logo Design Process! To create a logo that conveys a desired message, you first have to have a very good idea of what that message is. For this reason, I suggest starting with writing your Mission and Vision Statements first. Done well, these two statements define your company internally and externally. From here, I like to assemble a list of keywords that identify the product/service, culture and value proposition (differentiating characteristics). When I whittle the list down to about the 5-7 most important keywords, I then put each one through thesaurus.com to find interesting synonyms. I often find synonyms that inspire me visually and will spark a couple of directions that I want to pursue (I’m thinking of the icon here). They also may inspire a necessary slogan, but that’s for another day. I don’t want to get caught up in refining concepts that don’t warrant the time. Drawing very small usually creates unexpected smudges and I often find something completely unexpected in that messy little drawing that I will then take to the next level. I ALWAYS do Step 2 above before this next step, as I don’t want to bastardize or influence my own innate creativity up front — I’d risk forsaking something truly unique. Inspirational Googled images for my Effectium logo/slogan project. 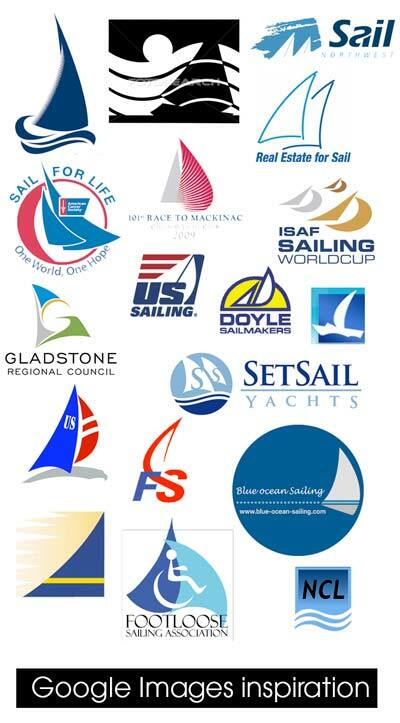 Client wants to incorporate “sailing” into concept (they customize CRMs for companies). Geeeeeeez, I hate to tell the masses this as I don’t want to risk being misunderstood and have someone find encouragement to plagiarize. I can’t stress this enough: If you don’t have enough innate skill to create a proper logo utilizing my process here, then have someone qualified do it for you. I use Images to find combinations of colors that I think are appropriate to my situation. I also like to find inspiring font choices. I also like to find inspiration for plays on negative space (talking icon now) or interesting use of initials. The keyword here is “inspiration” folks. After feeling significantly inspired, I usually refine my sketches a bit, and often come up with a new concept or two. Fonts: This is typically a bit time consuming (a few hours), as I type in the logo verbiage and painstakingly explore font combinations (I have hundreds). After coming up with dozens, I then whittle them down to just 5-10. Color palette: To this point, I’ve only drawn and typed in black and white and gray scale because if your design can’t hold up without the color, it’s not much of a design (kind of like a singer that requires autotune). Anyway, I delete the color swatches from the palette that I don’t like and add colors that I do like. Combine: Now I do my first combinations of all the above. This leaves me with about 8-10 wildly different directions. Halfway point in my Effectium logo/slogan project. Final logo/slogan versions that I polled on Facebook and presented to the client. The top one won, but in the end, we trimmed the slogan down to simply, “Putting the Wind in Your Sales”. At this point, I get away from it for the day, as I knew my brain is burnt out on this. With the next day comes a fresh perspective. The hard work is done and the fun part of the process begins tomorrow. As I said, coming back to this the next day is like having power restored after an outage — everything is just so much clearer and easier now. I play around with the concepts I left myself. I enhance some and move them to the left of my virtual desktop. I move some “maybes” to the right. I delete the “no ways”. From here I’ve usually whittled down my typographic choices to about two different styles. The icon is the big deal now. Goal: To simplify the design as much as possible while retaining the appropriate concept. A busy logo is a bad logo. I like to repeat this step a few times, setting aside an hour or two to refine, then getting away from it for the day. I usually end Step 5 when I’m down to 3-6 variations that I think are all very good. At this point, if privacy is not an issue, I like to post them to my Facebook page and ask people to vote on them (don’t forget to number them). Lots of people respond. It gives people a chance to be creative and to be heard, so getting a decent sample usually isn’t much of a problem. It’s very important to put it out there simply and correctly — meaning, state the problem: “I’ve been commissioned to create a logo for an electrical safety training company. It needs to be bold and appropriate to the trades industry.” THEN add your logo proofs. I’m pretty much always shocked by the results. More often than not a version that I didn’t expect being a leading contender ends up being the runaway winner. I usually get really good feedback as to why as well. Even suggestions on improvements to certain versions. Assuming this logo is for your own business, you’re probably good to go at this point. When I do this process for clients, I enjoy sending my proofs with brief explanations of the concepts next to each version. I lead into the email with something like, “Hi, Mr. Client. I’m excited to give you your first look at five sets of logo designs that I’m proposing for XYZ Company. I’ve also done a market testing on Facebook and I was pleasantly surprised with the feedback we received. But, I don’t want to influence your decision yet, so I’ll share the results after I receive your feedback”. <–––– This is a very wise move. It builds another level of trust and credibility as well as excitement. The best logos have a distinct concept that is refined to it’s simplest form. They utilize 2-3 colors that will become the signature colors used on the website, business cards, etc — so don’t take this lightly. For company names that don’t directly reflect the company’s product, service or industry, a good slogan is a must. You’ll find a lot of my own samples here: https://edwardscom.net/services/case-studies/. Click on “Logos”. Finally, when being commissioned to create a logo, I strongly suggest that you get a signed contract that clearly states that they will receive the initial proofs and then have only 3 sets of revisions before you go to hourly additional charges — this will prevent them, their staff, their friends and family members from taking over as Art Director. That’s a rabbit hole with no way out.